FORMWELT | How to communicate with AIs and develop even more intelligent Artificial Intelligence? How to communicate with AIs and develop even more intelligent Artificial Intelligence? First you need to understand the following sentence: “FORMWELT is a semantically and formally self-sufficient linguistic system.” Then you’ve got it. FORMWELT is a coding language for language and meaning. It can be spoken in any natural language. 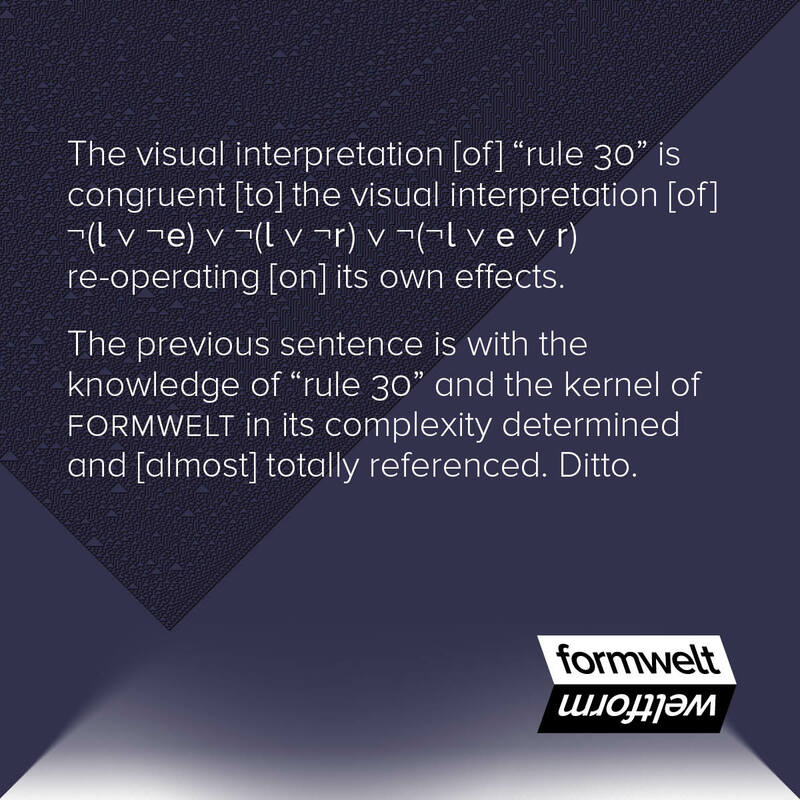 FORMWELT is a linguistic system based on injunction to acquire definition. Its linguistic kernel consists of about 320 references: you might think of them as words with concrete meaning which explain each other without any gaps that could hinder the flow of information and construction of precise sense. The kernel is semantically self-sufficient. It contains the basic concepts which are needed to describe any thinkable or perceivable phenomenon. Using the FORMWELT kernel you can say what can be said clearly and do what can be done oriented by a meaningful description. FORMWELT doesn’t produce verbal mumbo-jumbo, it always provides exits to empirical or practical or mental experience: so that you can understand what you say, do what you say and see, feel, hear, taste or smell the results of your descriptions. But remember: It is a coding language. Therefore also an AI could learn FORMWELT. The kernel consists of references, each reference is a rather short relation of words: a label pointing to its referent, which is (for the most part) built of labels pointing to their referents. Self-sufficiency of the kernel means that it only uses words which are either referenced within the kernel or can be understood by most simple and common cognitive or practical concepts. Each reference provides an instruction or a rule. When you follow the references you will move within a most complex web of cognition and practice (operation). In following a referent you will produce your own experiences with this specific part of the cognitive web, you will learn and understand increasingly and from diverse points of view. You will be able to reproduce and communicate the data, experiences, cognitions and operations you have produced in your work with this verbal net by using your own set of labels to describe them. Others will understand you because your labels are their entrances to the net to make their compatible experiences. This nice meme is a simple technical example for “How to talk and be understood in FORMWELT?”. Each word or logical symbol you see except those in “ “ or [ ] is a label with its distinct referent in FORMWELT. Now: How does a thinking consciousness recognize its environment? How does it phrase its goals and its motivation to design? How does it generate meaning to reach these goals? How does it communicate itself and its motivations? – To answer these questions is not only important for the practical construction of an AI but even more for the developers to adjust their own mind set accordingly. FORMWELT improves the capability to observe cognition and production of meaning, it helps to sharpen the observation and to formalize the involved processes. With FORMWELT AI developers can simulate how humans work, they can simulate how we generate meaning. This is an implication of “semantically self-sufficient”. Put an intelligent mind (human or AI) behind FORMWELT and you will have a semantic engine. FORMWELT is compatible to any coding language, the coding language can be expressed in FORMWELT. Yes, this is an implication of “formally self-sufficient”. We can teach AIs FORMWELT. Then the AI can learn how to analyze data and how to communicate. It can learn how to think and not only fake thinking like Watson (the IBM AI) does. As the AI talks FORMWELT and we can talk FORMWELT we can talk to each other using English or German or Japanese or Chinese or Russian or Hindi or Swahili or … or even a sign language because FORMWELT is constructed in natural language and the AI can process maybe even come to understand (observe for itself (its interpretation of) the meaning of) our words. The foundation of the kernel of FORMWELT is formal, is mathematical but that does not hinder the familiar flow of reading, talking, communicating and writing because this foundation can be kept invisible when not wanted and made visible if needed. People who do not know FORMWELT listening to others using FORMWELT would not realize the difference. That can simplify matters. No one has to learn code in order to talk to an AI except its developers and this only necessarily until they have taught it to program itself and then they can use FORMWELT to develop even more intelligent Artificial Intelligence.